When the Western Allied Forces landed on Normandy beaches, they faced the heavy coastal fortifications built by the Germans, which included the concrete and steel emplacements. These were part of the extensive Atlantic Wall, which created a defense system stronger than had been encountered before. It was these defenses for which the Petard spigot mortar was designed. In 1939, the British Ministry of Defense 1, also known as MD1 or Churchill’s Toyshop, began to carry out weapons research and development for the creation weapons to use in unique or unusual battle situations such as the beaches at Normandy. These creations came to be known as Hobart's Funnies, in reference to Major Percy Hobart, commander of the 79th Armored Division where they were assigned, and to their unique features. One of the designs was the 290 mm Petard spigot mortar. The mortar would replace the main gun on the Mk III or MK IV Churchill tank, in creating the AVRE (Armoured Vehicle Royal Engineers). See illustration above. (Not to scale). 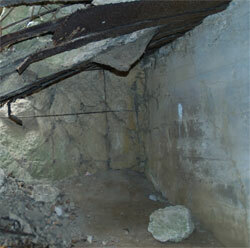 Damaged concrete fortification at Longues-sur-Mer Battery, the type of target for which the Petard was designed to destroy. The Petard spigot mortar was designed to destroy roadblocks, bunkers, pillboxes and other concrete, brick or earthen obstacles, and proved to be quite effective in breaking through these defenses. Public Domain photo, right, taken by Dennis Petters, shows a damaged concrete fortification located at Longues-sur-Mer Battery, the type of target for which the Petard was designed to destroy. Most effective at a range of about 80 yards the Petard fired a 26 pound finned charge within an outer casing, giving a total weight of 40 pounds. . This short-range spigot mortar threw its large explosive bomb at a low velocity. It was not intended as a defensive weapon for use against tanks but was quite capable of speedily leveling a concrete, fortification. The mortar round was called the Flying Dustbin because of the shape of the outer casing, which resembled what the British call a dustbin (what the Americans would call a trash can). Mortar round can be seen in photo below. Petard spigot mortar. Note mortar round to the right of soldier. The mortar was re-loaded by the machine gun operator/co-driver whose station was in the front of the hull, in the level below the turret. The AVRE had been fitted with a sliding hatch in the hull, located in front of the turret. From this hatch, the loader would partially exit the hull to insert the round. This was accomplished by “breaking” the barrel- tilting the rear portion downward until the barrel was in a vertical position. 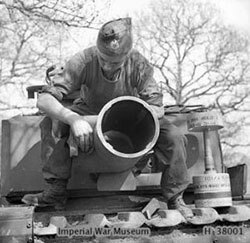 The mortar round could then be loaded from below, using lugs to hold it in place until the barrel was repositioned, with the loader exposing only his head and shoulders from the hull during this process. Imperial War Museum photo shows a Petard spigot mortar, which replaced the main turret gun on the Churchill AVRE (Armoured Vehicle Royal Engineers). Turret appears to be turned to the side, with the mortar barrel over the track. Soldier is possibly doing maintenance on the Petard. Note mortar round to the right of soldier. Firing the Petard was accomplished with a spring loaded rod (large firing pin). With the rod cranked back, it could be released to impact and ignite the propellant charge located on the mortar round. This process fired the large 290-mm demolition charge with adequate accuracy.